Wave after wave of red sand dune inconsistently covered with low-lying thornbushes and camelthorn trees broken only by the occasional dry pan or riverbed; marred only by the industrial towers of mining operations, miles of fences and the grazing cattle and sheep (and for some reason two camels). 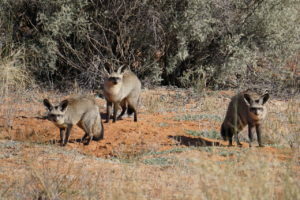 The Kalahari has always had a magical place in my imagination, the only other time I was near here was in the northern fringes of the desert – it was great but left me feeling like I hadn’t seen the real Kalahari. Now I can say I have seen it and the mystique of the place met the expectations of my imagination – and the feeling of a wilderness lost as we drove over the last dune before Upington and ugly city became visible over the otherwise unbroken horizon leaves me imagining how spectacular this vast wilderness must have been in the not too distant past. 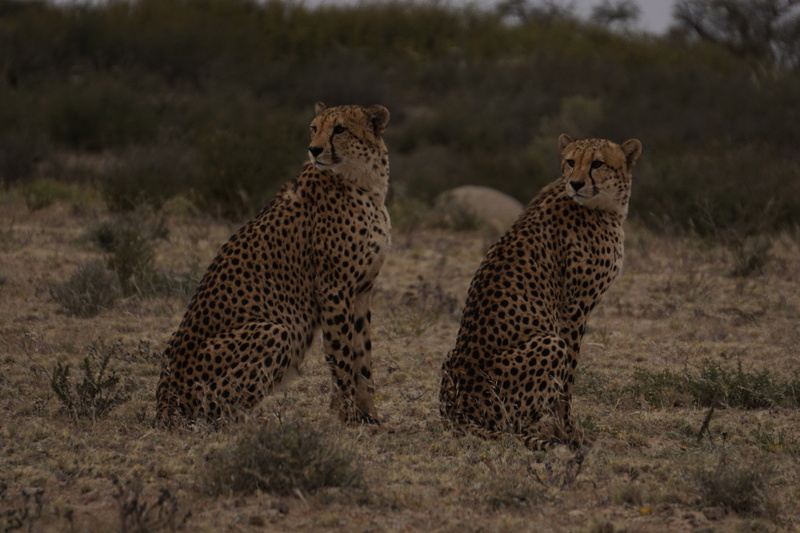 Kgalagadi Transfrontier Park, incorporating adjacent protected areas in Botswana and South Africa into a single game park, gave me a taste of the pristine wilderness that once covered the entire area. In some ways Kgalagadi is the Ying to Kruger’s Yang. The two parks are the most notable in South Africa’s stable of national parks offering somewhat mirror images. 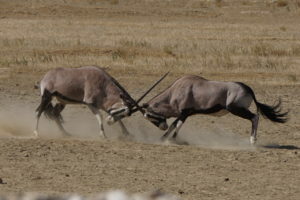 You trade the kudu and impala of Kruger for gemsbok and springbok dominating the plains, the savanna and bush is replaced with the desert of the Kalahari and the crowded paved roads are replaced with relatively empty, heavily corrugated sand roads. The game isn’t as dense as in Kruger but there still is plenty of it and the setting, at least in my mind, is more spectacular. The park is famed for its black-maned lions – which, though we saw lots of tracks and spoor, we were not lucky enough to see. 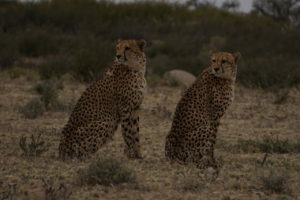 We did however spend 30 minutes with two cheetah a few feet from us resting, bathing, fondling one another and eventually stalking some gemsbok; it was the closest I had gotten to the cat since it tried to steal my camp chair 14 years ago at Otjitotongwe (a farm we will be returning to in a couple of weeks). 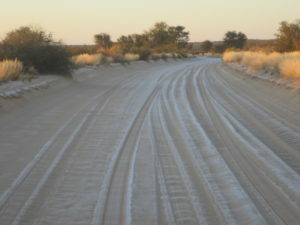 The main roads between the three developed camps are through two largely dry riverbeds scattered with solar-pumped waterholes. These are areas where game congregates and is relatively easy to see over the sand sprinkled with short bushes. However, the dune road that cut between the two rivers, taking you up and over one dune crest after another, offered some of the most stunning scenery I have ever driven through. 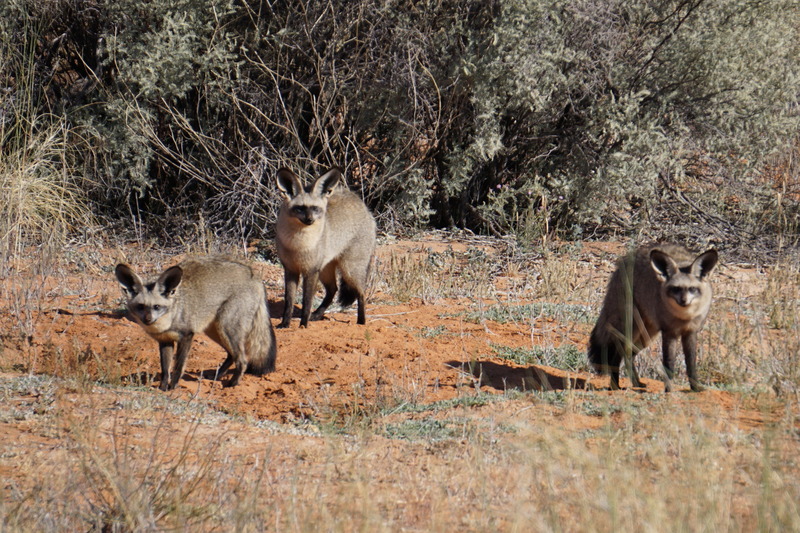 And while game sighting is more difficult on the dunes, in addition to the usual suspects (ostrich, gemsbok, springbok, hartebeest…) we saw honey badger and bat-eared foxes. 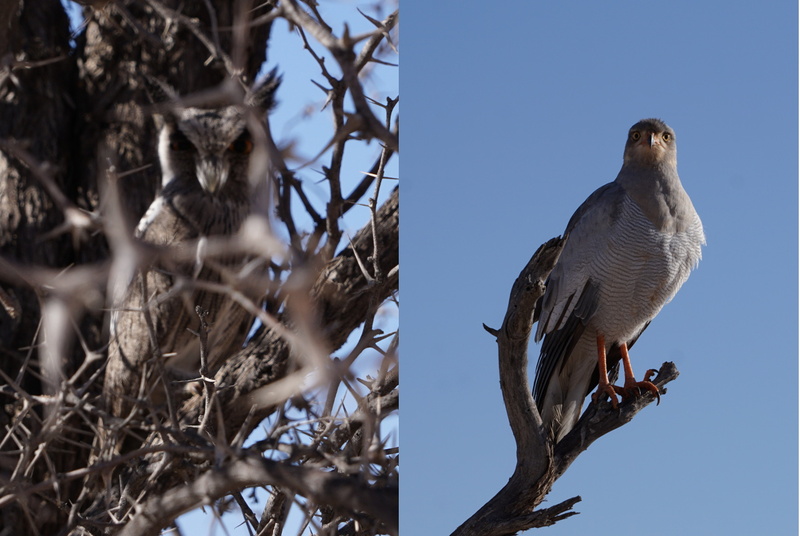 We also had some close sightings of various eagles, hawks and owls – I sometimes wish I was more of a bird watcher, we see so many of what I am told are rare species, I just never had the patience for it. Having seen it snow in the Sinai, Petra and Jerusalem – it is worth noting that we saw it rain (albeit about 25 drops over the course of several hours) and frost in the Kalahari. The nights have been chilly (some among us have called it cold) and we were accidentally lucky to be in a chalet for the coldest night instead of a tent – only needing to clean the frost off the windshield in the morning rather than our fingers and toes. Though, even I can acknowledge that when the straps of my Chacos froze overnight it was indeed on the cool side. Of course, the blazing sun of the day is hot enough (at least for three of us) to contemplate taking a dip in the small camp pool. Such is the weather of the desert. In the end, the tranquility and beauty of the red desert I’m looking out on has fulfilled my expectation of the Kalahari (we will hit its fringes again as we drive through Botswana) and leaves me wanting to return here for more time among its dunes. This also brings to an end our time in South Africa, at least until we return for our final week of the trip. We have covered ~8000 kilometers passing through every South African province along the way – it has been an excellent introduction into the Rainbow Nation, its people and natural wonders. 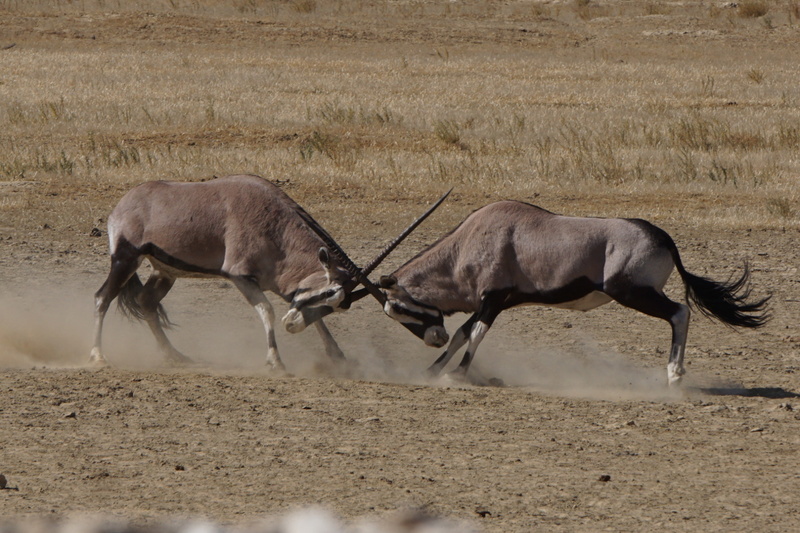 Tomorrow we cross into Namibia, conveniently located adjacent to our campsite, after having already gone through South African exit formalities four days ago when we arrived at Kgalagadi. We will be heading to Fish River Canyon before spending time in the other desert of our trip, the Namib. Cool does not describe how cold the desert was at night. Even with a sleeping bag liner, sleeping bag and two blankets covering long Underwear and a fleece, some of us were still shivering all night. When your chacos freeze it is cold!!! It was a little detail that even during the day most of us still had in multiple layers.